Large group of FDR and Truman White House invitations. 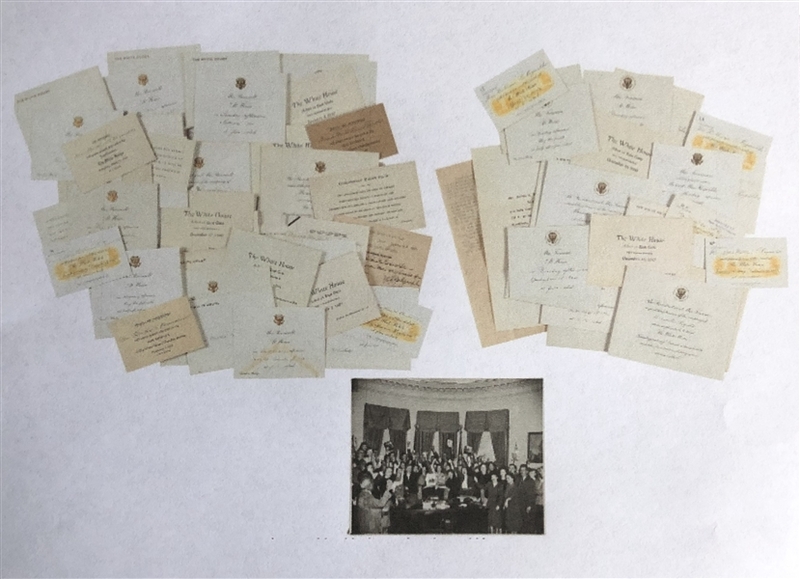 Twenty three invitations in all (8 Truman invitations and 15 Roosevelt invitations), all made out to Bertha Reynolds, who worked in the Roosevelt and Truman administrations. Also included is her salary, on WH stationery to work for President Truman, and duties expected as a staff member on another sheet of paper while working for the President, which has a split at the fold. Also included is an original photograph of Bertha holding a photograph of President Truman in the Oval office with other staff members. The invitation envelopes measure in size from 3 3/4" x 4 3/4" to 4 7/8" x 5 7/8". A few have some light toning, else an excellent group. An amazing collection of invitations, especially coming from a staff member of two prominent administrations.